On this date in 1982, Iranian revolutionary politician Sadegh Ghotbzadeh was shot in Tehran’s Evin Prison for supposedly plotting to overthrow the Islamic Republic. Ghotbzadeh had come by his revolutionary aspirations back in the 1950s and 1960s, after radicalizing as a teenager with the ouster of nationalist Prime Minister Mohammed Mossadegh; he’d be kicked out of Georgetown University for neglecting his studies in favor of protesting the U.S.-backed Shah and enter a twilight world of professional revolutionary exiles. 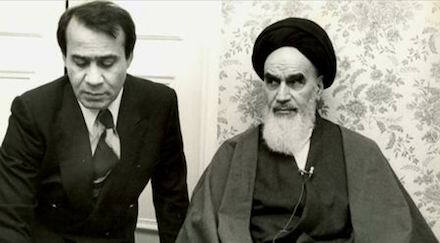 In Paris with the Ayatollah Khomeini. He eventually joined the circle orbiting the Ayatollah Khomenei, returning to Iran with him on the famous Air France flight of February 1, 1979. Ghotbzadeh would serve as the frequent translator and spokesman of Khomeini, eventually becoming Foreign Minister amid the tumult of the Iranian students’ seizure of U.S. embassy hostages in late 1979. In those fraught months, the urbane Ghotbzadeh became a familiar face on American televisions. He was notable advocate within Iran for quickly ending the hostage standoff, and spoke openly about Republican U.S. presidential candidate Ronald Reagan‘s ongoing behind-the-scenes project to prevent a hostage deal that might redound to his opponent’s electoral advantage. * His distaste for the hostage confrontation, as well as his westernized accoutrements, quickly set him at loggerheads with the revolution’s growing fundamentalist faction, and he was forced out of the foreign ministry in August 1980. * This project succeeded so spectacularly that it’s still officially a kooky conspiracy theory in American political culture.